Good morning on September 2nd and this report is coming to you from the National Park overlook, just above the Panorama Lodge where we are staying at Namche Bazaar. Before the Sherpas woke us up with coffee in our rooms this morning, Dave Hahn ran up here and determined that in fact our goal, Everest, was in view this morning in this monsoon season when often we don’t see it from this low. He came back and told so us so right now Rob, Kit, Sean and I and a lot of the Sherpas carrying our camera gear are up here paying tribute to our goal, our dream Chomolungma. It’s a beautiful morning. 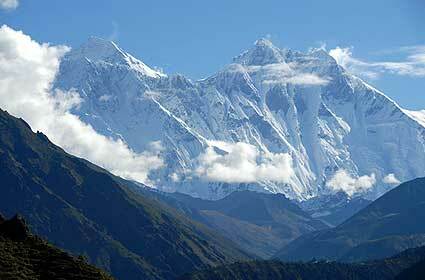 Ama Dablam looks stunning as well.